Aloha from Maui, Hawaii. We are having a great time on vacation this week. One of our favorite things to do is to eat our meals at the bar. It gives us a chance to interact with some of the locals and other guests sitting at the bar. My husband and I typically order appetizers and share them as our meal. This way we get a nice sampling of the flavors and we don't end up over eating. 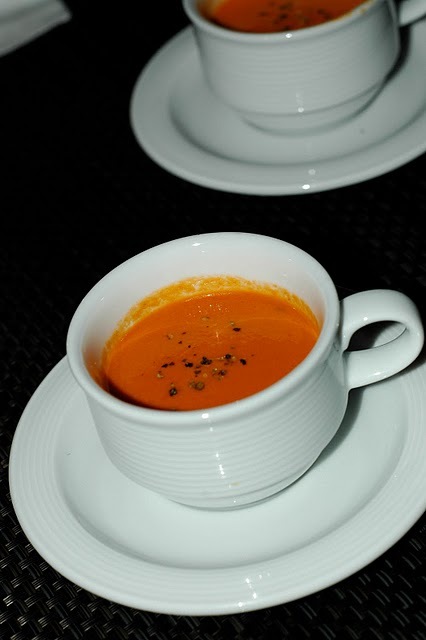 Last night we had this amazing tomato soup, Tuna Tartare, and Seafood Risotto at Spago Restaurant. Stay tuned to more pictures from Tropical Paradise.